RonaDeck Wet Pour Rubber Granule Surfacing from Ronacrete is a resin bound system that combines resin with rubber granules to provide a soft feel surfacing that will absorb impact and noise. 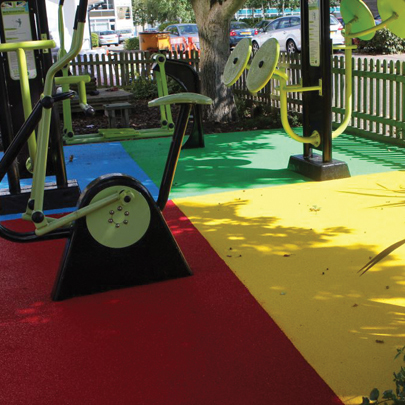 The surfacing is soft underfoot and absorbs some of the impact of a fall, making it particularly suitable for play areas where there is a risk of falling, it is also slip resistant. RonaDeck Wet Pour Rubber Granule Surfacing is also suitable for pool surrounds and other leisure applications such as golf courses. The surfacing is available in a selection of attractive colours with black, blue, green, red and yellow as standard; it is UV stable so the surfacing will not change colour after exposure to sunlight. The rubber granules are made from recycled rubber from the motor industry.